I'm gonna have to read that fur sure, thanks for sharing with us! 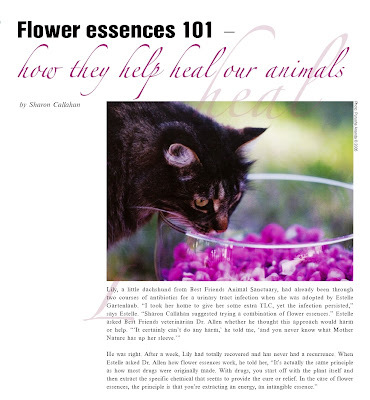 Our pet communicator has a special line of flower essences that she sometimes recommends. The Woman does not find they are useful to HER but then she says, she has a very dense body and they are subtle. Good articles about using them on pets can be hard to find. I have heard a lot about flower essences, but my human has yet to try them out. e just read the article and it is very interesting. This is great! Our mom has used some flower essences with us...like Rescue Remedy. Lately she's been using the ones recommended by Jackson Galaxy...Spirit Essences. We'll be interested in reading your series! Dis will be good, weee luv's learnin about herbs and flowers for there healing powers.. Can't wait. My woman has used these off and on for a long time. Sometimes they work, sometimes, not. She used the pet version (no alcohol) of rescue remedy on us when we first came here. We were very upset to find a kitty already in residence. We guess it must have helped, 'cause we would only give a little hiss when we went by him. this bee a grate artycul N thanx for sharin...we loved de storee but de elephant :) cant wait ta reed sum more as R mom bee leeves in alternative medisin for herself N us ! !